Property Size 2,489 sq. ft. Vacation Happy in this gorgeous home with Private Pool and Spa outside and Jacuzzi Tub with separate shower in the Master Suite. Located in the beautiful Tralfager Resort Community, this spacious home is perfect for your family's vacation of a lifetime. A full service kitchen with granite countertops, dinning area and living room with a triple sliding glass door onto the private pool and spa deck. Comfort abounds! 4 Bedrooms/3 Bathrooms Home with Private, Screened Pool, Spa, Resort Community, Jacuzzi Tub, Wireless Highspeed Internet Expanded Cable, a Master Suite and Beautiful Furnishings. A Disney entrance is only 11.9 miles away. Sea World, Universal, and the Convention Center are approx. 15 minutes beyond that. Our stay was fantastic; my family of 3 adult couples truly enjoyed the accommodations; our stay at 4981 Bond Street West worked very well with our vacation schedule. The check in - checkout process was very convenient and an excellent upgrade versus pick up the key process. The rental home was close to the majority of our points of interest and also provided access to a community centre; in which our group utilized the large pool and golf driving range. In regards to security; we felt very secure; the officers on site were very polite and professional; no issues to talk about. 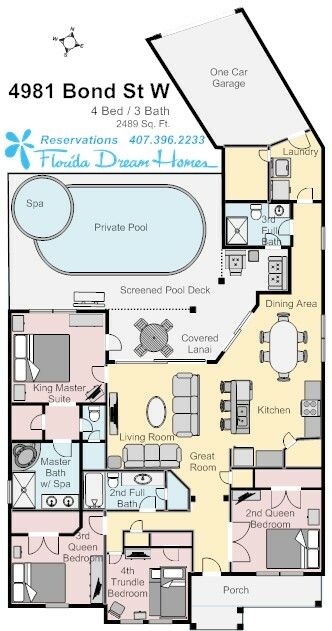 Our family will be contacting Florida Dream Homes when our next vacation includes Florida. I believe we have dealt with your company since 2006; and have always had great service and look forward to our next visit. My family of 7 had a wonderful time at our Florida Dream home. The house was exactly as described and the customer service was amazing! We will definitely stay again. Thank you so much for this perfect experience. Our stay in Kissimee was a dream. We asked for a little house for three persons and were informed that we were lucky to receive an upgrade. It was a wonderful house offering all we needed for a perfect stay. Even a private pool was included. Everything was pretty tidy and we missed nothing. 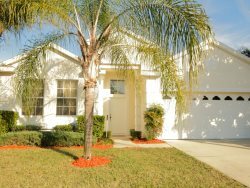 So we are pleased to recommend Florida Dream Homes to everyone who is looking for a perfect stay not far from Disney World.